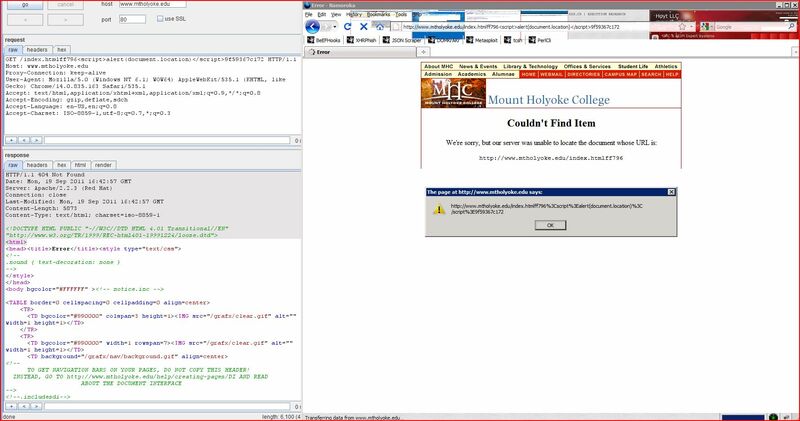 Report generated by XSS.CX at Mon Sep 19 16:46:37 CDT 2011. The value of the alt_email_address request parameter is copied into the value of an HTML tag attribute which is encapsulated in double quotation marks. The payload dd58e"><script>alert(1)</script>fa6cde378aa was submitted in the alt_email_address parameter. This input was echoed unmodified in the application's response. The name of an arbitrarily supplied request parameter is copied into the value of an HTML tag attribute which is encapsulated in double quotation marks. The payload f4042"><script>alert(1)</script>91d1767980 was submitted in the name of an arbitrarily supplied request parameter. This input was echoed unmodified in the application's response. The name of an arbitrarily supplied request parameter is copied into the value of an HTML tag attribute which is encapsulated in double quotation marks. The payload 1929c"><script>alert(1)</script>38623b858a49857ef was submitted in the name of an arbitrarily supplied request parameter. This input was echoed unmodified in the application's response. 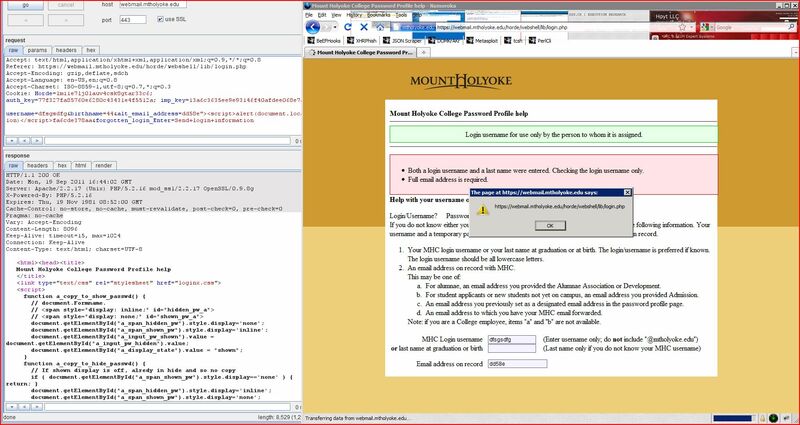 The original request used the POST method, however it was possible to convert the request to use the GET method, to enable easier demonstration and delivery of the attack. The value of the username request parameter is copied into the value of an HTML tag attribute which is encapsulated in double quotation marks. The payload 3ab77"><script>alert(1)</script>68fa1d8a069 was submitted in the username parameter. This input was echoed unmodified in the application's response. The value of REST URL parameter 1 is copied into the HTML document as plain text between tags. The payload cc950<script>alert(1)</script>001c61adeef was submitted in the REST URL parameter 1. This input was echoed unmodified in the application's response. The value of REST URL parameter 1 is copied into the HTML document as plain text between tags. The payload 808ef<script>alert(1)</script>79185c3b56c was submitted in the REST URL parameter 1. This input was echoed unmodified in the application's response. The value of REST URL parameter 2 is copied into the HTML document as plain text between tags. The payload f5788<script>alert(1)</script>bdd99501441 was submitted in the REST URL parameter 2. This input was echoed unmodified in the application's response. The value of REST URL parameter 1 is copied into the HTML document as plain text between tags. The payload ff796<script>alert(1)</script>9f59367c172 was submitted in the REST URL parameter 1. This input was echoed unmodified in the application's response. The value of REST URL parameter 1 is copied into the HTML document as plain text between tags. The payload f87b9<script>alert(1)</script>41d5dfc2fac was submitted in the REST URL parameter 1. This input was echoed unmodified in the application's response. The value of REST URL parameter 2 is copied into the HTML document as plain text between tags. The payload 2560b<script>alert(1)</script>855a4c92fec was submitted in the REST URL parameter 2. This input was echoed unmodified in the application's response. The value of REST URL parameter 1 is copied into the HTML document as plain text between tags. The payload 2373d<script>alert(1)</script>f1b1b405858 was submitted in the REST URL parameter 1. This input was echoed unmodified in the application's response. The value of REST URL parameter 2 is copied into the HTML document as plain text between tags. The payload 53dce<script>alert(1)</script>93b0ff9bfdd was submitted in the REST URL parameter 2. This input was echoed unmodified in the application's response. The value of REST URL parameter 3 is copied into the HTML document as plain text between tags. The payload fc1f8<script>alert(1)</script>a83c83ef23b was submitted in the REST URL parameter 3. This input was echoed unmodified in the application's response. The value of REST URL parameter 1 is copied into the HTML document as plain text between tags. The payload 81e80<script>alert(1)</script>9a28ff1f497 was submitted in the REST URL parameter 1. This input was echoed unmodified in the application's response. The value of REST URL parameter 2 is copied into the HTML document as plain text between tags. The payload 2db3c<script>alert(1)</script>f02040761ee was submitted in the REST URL parameter 2. This input was echoed unmodified in the application's response. The value of REST URL parameter 1 is copied into the HTML document as plain text between tags. The payload eafbf<script>alert(1)</script>bbbea6bf8fe was submitted in the REST URL parameter 1. This input was echoed unmodified in the application's response. The value of REST URL parameter 1 is copied into the HTML document as plain text between tags. The payload ba0af<script>alert(1)</script>ede9f099f76 was submitted in the REST URL parameter 1. This input was echoed unmodified in the application's response. The value of REST URL parameter 1 is copied into the HTML document as plain text between tags. The payload 219f9<script>alert(1)</script>36961e58a41 was submitted in the REST URL parameter 1. This input was echoed unmodified in the application's response. The value of REST URL parameter 1 is copied into the HTML document as plain text between tags. The payload ea72b<script>alert(1)</script>eb576dd6a6b was submitted in the REST URL parameter 1. This input was echoed unmodified in the application's response. The value of REST URL parameter 1 is copied into the HTML document as plain text between tags. The payload 7206a<script>alert(1)</script>7bc0d20fd0 was submitted in the REST URL parameter 1. This input was echoed unmodified in the application's response. The value of REST URL parameter 1 is copied into the HTML document as plain text between tags. The payload 6fcdf<script>alert(1)</script>f3087bb49a was submitted in the REST URL parameter 1. This input was echoed unmodified in the application's response. The value of REST URL parameter 1 is copied into the HTML document as plain text between tags. The payload 225d6<script>alert(1)</script>047998f0b2b was submitted in the REST URL parameter 1. This input was echoed unmodified in the application's response. The value of REST URL parameter 1 is copied into the HTML document as plain text between tags. The payload f3139<script>alert(1)</script>a5567f04b93 was submitted in the REST URL parameter 1. This input was echoed unmodified in the application's response. The value of REST URL parameter 1 is copied into the HTML document as plain text between tags. The payload f1505<script>alert(1)</script>cfbf0ff83aa was submitted in the REST URL parameter 1. This input was echoed unmodified in the application's response. The value of REST URL parameter 1 is copied into the HTML document as plain text between tags. The payload 1afa4<script>alert(1)</script>019a311c6a6 was submitted in the REST URL parameter 1. This input was echoed unmodified in the application's response. The value of REST URL parameter 1 is copied into the HTML document as plain text between tags. The payload f51ae<script>alert(1)</script>5c5cf5421 was submitted in the REST URL parameter 1. This input was echoed unmodified in the application's response. The value of REST URL parameter 1 is copied into the HTML document as plain text between tags. The payload 1c944<script>alert(1)</script>019930f4842 was submitted in the REST URL parameter 1. This input was echoed unmodified in the application's response. The value of REST URL parameter 1 is copied into the HTML document as plain text between tags. The payload 1e7f1<script>alert(1)</script>88a8cb3e036 was submitted in the REST URL parameter 1. This input was echoed unmodified in the application's response. The value of REST URL parameter 1 is copied into the HTML document as plain text between tags. The payload 98380<script>alert(1)</script>8f3bfccf7c2 was submitted in the REST URL parameter 1. This input was echoed unmodified in the application's response. The value of REST URL parameter 1 is copied into the HTML document as plain text between tags. The payload 61e4c<script>alert(1)</script>956efcad831 was submitted in the REST URL parameter 1. This input was echoed unmodified in the application's response. The value of REST URL parameter 1 is copied into the HTML document as plain text between tags. The payload 3712d<script>alert(1)</script>60fb43f63d7 was submitted in the REST URL parameter 1. This input was echoed unmodified in the application's response. The value of REST URL parameter 1 is copied into the HTML document as plain text between tags. The payload e8ebd<script>alert(1)</script>01b2a17e6f1 was submitted in the REST URL parameter 1. This input was echoed unmodified in the application's response. The value of REST URL parameter 1 is copied into the HTML document as plain text between tags. The payload dd6ee<script>alert(1)</script>1f9004c407e was submitted in the REST URL parameter 1. This input was echoed unmodified in the application's response. The value of REST URL parameter 1 is copied into the HTML document as plain text between tags. The payload 4b854<script>alert(1)</script>b1335b0f9cf was submitted in the REST URL parameter 1. This input was echoed unmodified in the application's response. The value of REST URL parameter 1 is copied into the HTML document as plain text between tags. The payload 4a232<script>alert(1)</script>1e4dd8b2b2c was submitted in the REST URL parameter 1. This input was echoed unmodified in the application's response. The value of REST URL parameter 1 is copied into the HTML document as plain text between tags. The payload 2eda3<script>alert(1)</script>1c19d1117a5 was submitted in the REST URL parameter 1. This input was echoed unmodified in the application's response. The value of REST URL parameter 1 is copied into the HTML document as plain text between tags. The payload 76778<script>alert(1)</script>6d6ec989bc6 was submitted in the REST URL parameter 1. This input was echoed unmodified in the application's response. Unless directed otherwise, browsers may store a local cached copy of content received from web servers. Some browsers, including Internet Explorer, cache content accessed via HTTPS. If sensitive information in application responses is stored in the local cache, then this may be retrieved by other users who have access to the same computer at a future time. If a web response states that it contains HTML content but does not specify a character set, then the browser may analyse the HTML and attempt to determine which character set it appears to be using. Even if the majority of the HTML actually employs a standard character set such as UTF-8, the presence of non-standard characters anywhere in the response may cause the browser to interpret the content using a different character set. This can have unexpected results, and can lead to cross-site scripting vulnerabilities in which non-standard encodings like UTF-7 can be used to bypass the application's defensive filters. In most cases, the absence of a charset directive does not constitute a security flaw, particularly if the response contains static content. You should review the contents of the response and the context in which it appears to determine whether any vulnerability exists. For every response containing HTML content, the application should include within the Content-type header a directive specifying a standard recognised character set, for example charset=ISO-8859-1. The response states that it contains plain text. However, it actually appears to contain unrecognised content.